Worth the wait, I hope: Pencils with animal names (the type of animal, not Fluffy), having animal logos when possible. I’ve limited it to one per animal, for the most part. Eberhard Faber’s generic Fish looks like it might be on a platter. Of all possible animals, who’d have thought that the camel would be the most popular? These are from makers in five different countries: United States, Japan, Germany, China, and Korea. I don’t know what a “suncow” is, but I say it’s a mythical creature. Below are closer views of animal logos. Click on them for pictures twice as large. I recently got an iPad and found that large pictures sometimes display with low resolution. FRED’S PENCILS received its 20,000th click yesterday! My thanks to all of you. 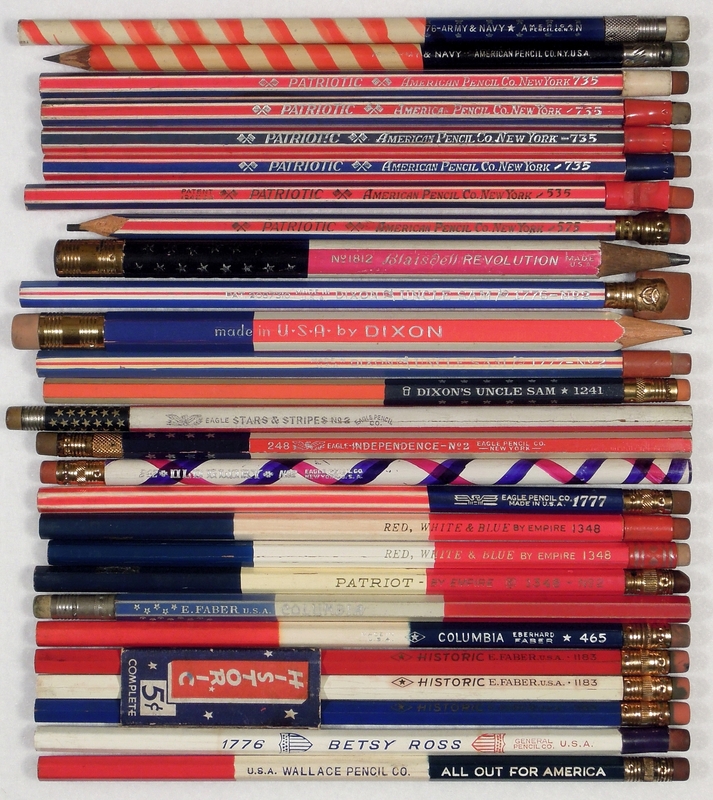 In celebration of this day, the Fourth of July, Independence Day of the United States of America, I have the privilege to present to you: Patriotic Red, White, and Blue pencils of all kinds. The Eberhard Faber ones have a “MADE IN PHIL.” imprint. The Master’s has an MPC logo; presumably this stands for Master Pencil Co.
Theoretically, that would be just a tad harder than the Berol Mirado’s 1½. The Eagle card also provides details of an old B/H system that was used for high-quality art and drafting pencils. They squeezed an FHB between HB and F.
On this, my 50th birthday, allow me to engage in a bit of personal nostalgia — pencil-related, of course. We got a classic yellow pencil, the Ravenwood by Reliance. This was the official brand for the rest of elementary school. It was a revelation to me when I discovered that it came in different lead hardnesses. My interest in pencils was piqued, but I was not yet a collector. It was obviously a pencil, but very different from a Ravenwood — two colors, a different metal part, and a really strange “2A” lead number. Intriguing! Fascinating! I kept it. I can pinpoint my becoming a PENCIL COLLECTOR to this event, this pencil, thirty-eight years ago. But I still don’t know what that “A” signifies. After that, I would ask my classmates, “Can I trade for that pencil?” when they were holding a pencil that I needed. I was also an avid scavenger, always scanning the ground for dropped pencils. I am not sure why, but on rainy days I could always find several pencils on the school grounds. It is a presswood board with 840 holes I made with a hand drill. I used clear nylon fishing line to tie up the pencils. I was very proud of that thing. I put it on my bedroom wall and could hardly stop looking at it. In the summer of 1980, I displayed my collection in the hobby exhibit at the San Diego County Fair. My sister had won First Place honors there for her troll collection, and I wanted the same glory. I did win a First, which was great. Something bad happened, though. The display was covered with a sheet of clear plastic, but someone worked one of the pencils out and stole it. I lost all faith in humanity that day, along with my irreplaceable, square-shaped, dark metallic blue, MechaMania Boy pencil from Japan.